A bright bouquet of chrysanthemums, in whites and yellows, long lasting asiatic lilies and fresh seasonal blooms with mixed lush green foliages. Beautifully gift wrapped and delivered in a convenient temporary vase. 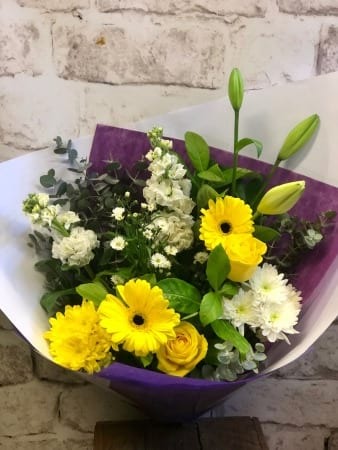 A perfect gift to say Happy Birthday, Thank You or just because, a unique bouquet from Amaranthine Flowers By Design, Charlestown Square, your florist in Newcastle.